Incense Sicks is staple for Indian rituals and ceremonies. Apart from its functional use of creating a smoky environment, Incense Stick is admired for the fragrances that soothes both mind and body. 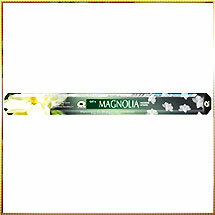 With its widening market, even on global front and commercial uses, we have come with an exotic range of Magnolia fragrant based Incense Stick. Our collection of Magnolia Incense Stick is prepared keeping in mind the purity maintained during rituals and ceremonies. Mostly found in North-East India, Magnolia is highly valued flower having strong fragrant. When referred to its ancient genus, it is found that this flower has been evolved even before bees appeared. Magnolias have undifferentiated flower parts for which the new term "tepals" have been coined. Our Magnolia based Incense Stick is highly appreciated for its enchanting fragrance that soothes the mind, body, and spirit. Moreover, the fragrance has long lingering effect and the stick burns for longer period of time owing to its long sizes and special biotic materials. These sticks are packed in attractive packs imprinted with stunning design and color-combinations.